Life on Mars - Brighten and Lighten - The Transformation! Brighten and Lighten – The Transformation! 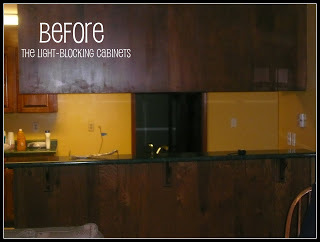 I’ve been talking a lot about brightening up both the kitchen and the family room. Both spaces were so dark, even in the middle of the day. So I’ve been using all the tools in my arsenal (and stealing a few from other people’s as well) to brighten up both spaces. 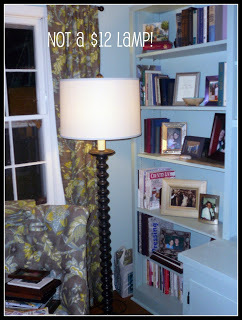 Check out my $12 lamp from TJ Maxx! Gotta love that store. The fixture had broken off, but a little super glue and 30 seconds took care of that. I knew that linen-like shade would look good against the grass cloth. 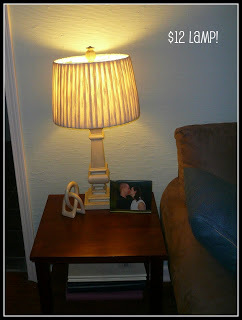 So I spent the $$$ that I saved from the other lamp on a GORGEOUS floor lamp from Bassett. Now to be fair, I did get it at 30% off when I bought the couch, but it’s still not an especially good deal. However, I loved it, it’s perfect for the spot and totally worth every penny. 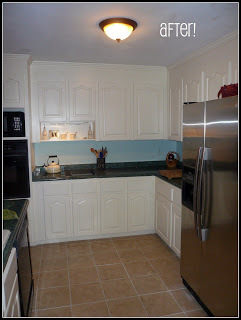 We ‘ll talk about that process of painting the cabinets at another time. Let’s just say IT WAS NOT FUN. Replacing that hideous fluorescent light was a good decision, which some people advised against. 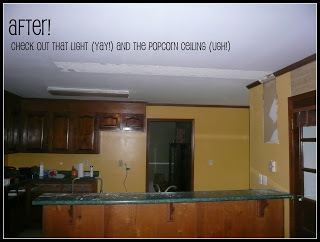 The “new” fixture came from the family room where we hung the new ceiling fan… so it was FREE! Not too shabby. 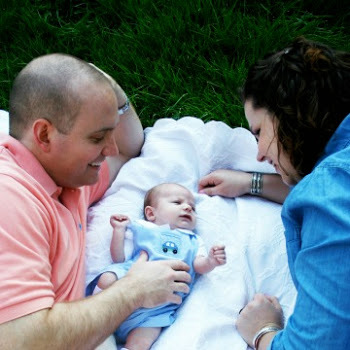 I really need to brag on my wonderful husband for a minute. 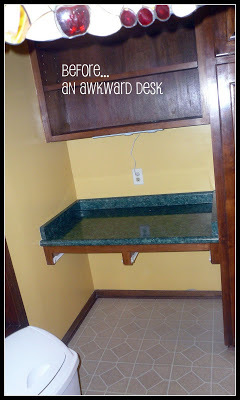 We had this weird desk in the corner of the kitchen. and put them under the old desk. 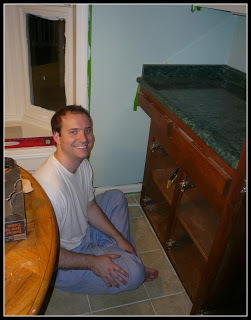 Seriously, how cute is he and how great do my new cabinets look? Now, I know I make that sound like a simple process, but it wasn’t. He had to cut them off of the original structure and build a box for them to sit on… he did a lot to make this work for me. 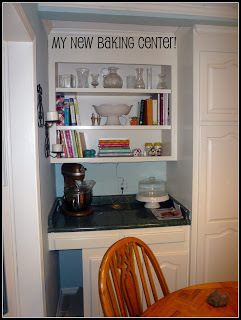 When all was said and done, I now have a perfectly sized baking center under all my cookbooks. I LOVE IT! 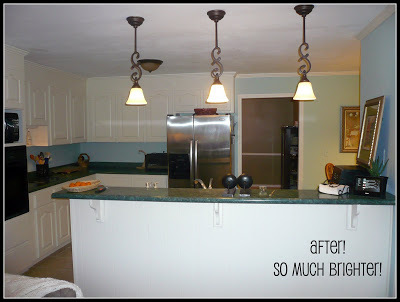 It’s really one of my favorite things about the kitchen (along with the pendants… I do love those pendants). I still have to add the cabinet hardware and touch them up, but overall, I’m happy to be in a functional kitchen again. 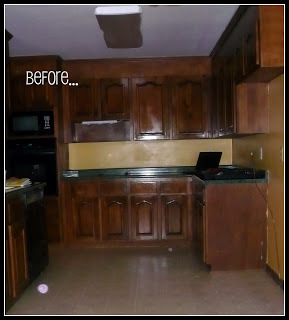 What do you think of the kitchen transformation?